See how Rob and his family are using SmartThings to secure their home, save energy, and kick back after dark. You can trigger a custom message on your Sonos (or ObyThing) by using the Sonos Notify with Sound SmartApp in SmartThings Labs. Since Rob wants to be notified when his wife arrives back home, he can either trigger the message when her SmartSense Presence comes within range of the Hub, or when her smartphone arrives in the area Rob has listed as his home area in the SmartThings app. You can also trigger custom messages when any number of events take place. After installing a smart lock, you’ll want to select where your home or business is located using the SmartThings app. Since all smartphones have GPS sensing built in to them, anytime you enter and exit the geo-fence you’ve selected around your home while your phone is with you, SmartThings can detect that you’re approaching your home or leaving it. To trigger your door to automatically unlock when you arrive, you’ll want to tap the first prompt. If you need to add a new door, you can give it a name (like “Front Door”) and select whether it’s a conventional door or a garage door. Next, you’ll select your smart lock, and choose the person or people who you’d like to trigger the door to automatically unlock. We are currently working on an official integration to support Nest thermostats. In the meantime, there are several IFTTT recipes that let SmartThings customers control and automate their Nest devices. SmartThings customers can also control their Nest thermostats by following these instructions that a developer in our Community created. 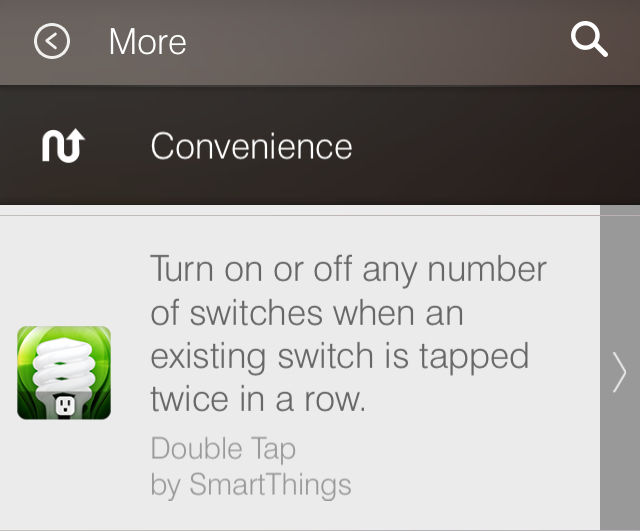 The Double Tap SmartApp can turn on or off two or more switches when you tap a smart in-wall switch twice in a row. As an example, if you want to turn on the light at the top and bottom of a staircase, all of the lamps in a room, or – in Rob’s case – the overhead and bar lights in his basement, this is super handy. The Double Tap SmartApp is found in the More header in SmartSetup, under the Convenience category. Rob keeps a SmartSense Multi sensor in his daughter’s room. When the temperature falls below 70 degrees, it automatically turns the fan off. There are several different SmartApps (found in the More section of SmartSetup) that can turn things on or off when the temperature reaches a certain threshold. Rob uses Virtual Thermostat, found in the Green Living Category. Since his fan is controlled with a smart GE in-wall switch, that’s the “outlet” that he’s selecting to trigger this action. Rob keeps a SmartSense Motion sensor in his closet to be notified if any of his cats wander in there. To get notifications when any of your motion sensors detects movement in or around your home, simply go into the SmartSetup area of the app, select Alerts and then Motion, select “Notify me if there is motion while I am away from home,” name the area where you’d like to monitor movement (ie: “Closet”), and then select the motion sensor you’d like to use. Note: If you’d like to only get notifications when you’re away from home, simply tap the + icon and then select this to only trigger when you’re in “Away” mode. A little water can go a long way. Rob keeps a SmartSense Moisture sensor in his basement, and it’s saved him once already.